Christian greetings in the precious Name of our Lord Jesus Christ; we welcome you to fellowship around God's unchanging Word. This completes our study of The Seventh Seal of "the Revelation of Jesus Christ who sent and signified it by His angel [William Branham] to His servant John . . . who was on the Island of Patmos for the Word of God and for the testimony of Jesus Christ" (Revelation 1:1, 7). If you are new to fellowship we encourage you to study this series from Newsletter #627 to the present issue and invite you to request our free PowerPoint presentation, "The Second Coming of Christ". Without success we have sought someone proficient in converting our PowerPoint presentation to Flash or similar format more amenable to display on the internet. Please advise us if you know some individual or company with this expertise. Washington, August 6, 2010  The Defense Security Cooperation Agency notified Congress today of a possible Foreign Military Sale to Israel of unleaded gasoline, JP-8 aviation fuel and diesel fuel for an estimated cost of $2 billion. The Government of Israel has requested a possible sale of 60,000,000 gallons of unleaded gasoline, 284,000,000 gallons of JP-8 aviation jet fuel (suitable only for military use, and 100,000,000 gallons of diesel fuel. The estimated cost is $2 billion. . . Comment: If Israel was planning to strike Iran that would explain the requirement for the large amounts of JP-8 fuel. However, it does not explain Israel's need for such large amounts of gasoline and diesel fuel unless it is planning some other ground incursion, say Lebanon, Syria, Gaza and the West Bank when the 'final solution' against Iran is launched. The shelf life of JP fuels is about 18 months, though the common recommendation is not to use fuel more than about 6-8 months old except in an emergency. August 9, 2010  Nine years ago this week Larry Silverstein and his partner, the former Israeli commando Frank Lowy, closed the deal on the 99-year lease of the World Trade Center. Silverstein and Lowy, devoted agents of the state of Israel and its Zionist fund-raising organizations in New York, immediately had their leased WTC property and future rental earnings insured against a terror attack exactly like that which occurred only seven weeks later. Having obtained the lease with borrowed funds, Silverstein promptly raised rents forty percent. . . Whoever placed the super-thermite and other explosive charges in the Twin Towers probably did so during the seven weeks before 9/11, when Silverstein completely controlled access to the towers. Apart from all the other questions, Silverstein has never been held to account for the fact that the escape doors to the roof of both towers had been locked. Why were rooftop evacuations not attempted? Larry Silverstein had control of all three towers that were demolished on 9-11. The explosive demolition of his three buildings made him a billionaire. Under the Rothschild Zionist crimocracy that controls New York City and the United States, Silverstein has been richly rewarded for his role in terrorism and mass murderrather than investigated and punished. . .
All of the federal debt and the immense sums that have been wasted on the disastrous wars in Afghanistan and Iraq are "borrowed" funds, i.e. money created by commercial banks like those owned by the house of Rothschild, which has a two-hundred year history of instigating war for profit. ". . . having been failed by Christianity, and with unemployment on every hand, those who have been without jobs for five years or more will turn away from the church and seek solace in drugs. That is when full control of the drug trade must be completed in order that the governments of all countries who are under our jurisdiction will have a MONOPOLY which we will control through supply. . . Drug bars will take care of the unruly and the discontent, would be revolutionaries will be turned into harmless addicts with no will of their own...."
There is ample evidence that the CIA and British intelligence, specially MI6, have already spent at least a decade working toward this goal" (Dr. John Coleman, Committee of 300, p. 144). 9/11 Families object to Official Story? This original complaint, filed in January 2009, claimed that 'this vast program of human experimentation, shrouded in secrecy,' was done without informed consent of the soldier-guinea pigs. 'In 1970, defendants provided Congress with an alphabetical list showing that they had tested 145 drugs during Projects Bluebird, Artichoke, MKULTRA and MKDELTA.' These drugs included sarin and other deadly nerve toxins, barbiturates, irritants, including cyanide, phosgene nerve gas, LSC, PCP and other psychedelics, THC 'about ten times the then-street strength of marijuana,' and tranquilizers. . . Comment: The Royal Institute for International Affairs (RIIA), had the Tavistock Institute create Britain's Psychological Warfare Bureau. The largest brainwashing facility in the world, it experimented on 80,000 British Army guinea pigs. 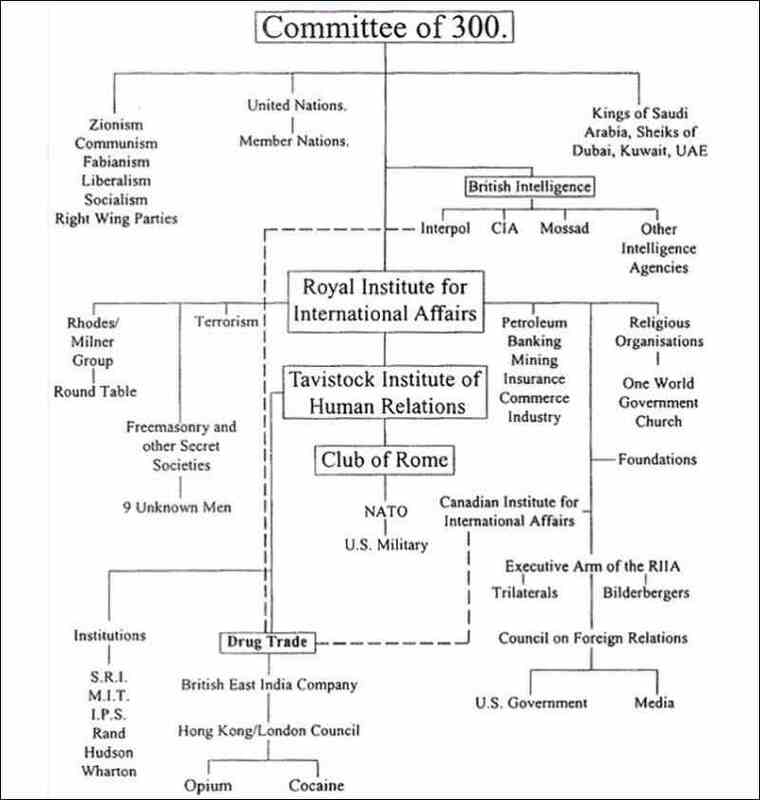 The CIA was set up by British Intelligence with whom it is obliged to share intelligence secrets. Nothing happens in the US happens sanction of the City's RIIA. (This 'special relationship was responsible for the US fighting Gulf War I in behalf of British interests, principally British Petroleum. See City of London organization chart). June 11, 2010  Here is what was discovered regarding COREXIT during and after the Exxon Valdez clean-up: 2-butoxyethanol (an ingredient of COREXIT) is a paint solvent, dry cleaning solvent, also used in dissolving plastics. Corexit causes hemolytic anemia (low Red Blood Counts) because the body prematurely destroys its own red blood cells and worse. Workers exposed to Corexit feel tired all the time from the blood damage (anemic). Their children are at greater risk for brain tumors and leukemia from over exposure to this solvent. 38% of COREXIT 9527 is made up of this toxic solvent that dissolves plastic. August 31, 2010  The Gulf of Mexico is a biological time bomb that is undoubtedly evolving into a chemically induced breeding ground for mutating viruses. All the aspects exist in the Gulf right now and have been established for over three months. Their ongoing manipulated evolution into a viral plague or viral epidemic is evident, yet has been ignored. Corexit is mutagen when in the presence of bacteria, for which the Gulf of Mexico is a primary aquatic source. . . What we're seeing in the Gulf of Mexico is a vast microorganism community of bacteriological viruses (bacteriophages) that are prime candidates for mutation if certain factors are present, such as mutagenic chemicals . . . Comment: "In 1986 the Committee of 300 ordered the pressure turned up. The US was not going down fast enough. The United States began the process of 'recognizing' the butchers of Cambodia, the criminal Pol Pot regime, self confessors to the murder of 2 million Cambodian citizens. In 1991, the wheel turned the full circle. The United States went to war against a friendly nation that had been programmed to trust the Washington traitors. We accused President Hussein of the small nation of Iraq of all manner of evil, NONE OF WHICH WAS EVEN REMOTELY TRUE. We killed and maimed its children; we left them to starve and to die of all manner of diseases. In the same breath we sent the Bush emissaries of the Committee of 300 to Cambodia to 'RECOGNIZE' the evil mass murderers of 2 million Cambodians, who were sacrificed by the Committee of 300’s depopulation of cities experiment, which the big cities of the United States will experience in the not too distant future . . .
At least 4 billion 'useless eaters' shall be eliminated by the year 2050 by means of limited wars, organized epidemics of fatal rapid-acting diseases and starvation. Energy, food and water shall be kept at subsistence levels for the non-elite, starting with the White populations of Western Europe and North America and then spreading to other races. The population of Canada, Western Europe and the United States will be decimated more rapidly than on other continents, until the world's population reaches a manageable level of 1 billion, of which 500 million will consist of Chinese and Japanese races, selected because they are people who have been regimented for centuries and who are accustomed to obeying authority without question. From time to time there shall be artificially contrived food and water shortages and medical care to remind the masses that their very existence depends on the goodwill of the Committee of 300. After the destruction of housing, auto, steel and heavy goods industries, there shall be limited housing, and industries of any kind allowed to remain shall be under the direction of NATO's Club of Rome as shall all scientific and space exploration development, limited to the elite under the control of the 156 Committee of 300" (Dr. John Coleman, The Committee of 300). Now you know the objectives and masters of Obama and other governments of colonies and occupied nations of 'the City of London.' Do you now see why your government permits alien jets to overfly spraying nanotechnology in chemtrails? While the articles on this website generally contain a sleight of hand and consequent disinformation for the credulous who read linked phrases without visiting the links which often tell the opposite story, I believe the broad claims in this article represents the real picture and the ongoing fulfillment of Revelation 6:8. September, 2010  AFTER 10 years of comparative slumber, the sun is waking upand it's got astronomers on full alert. . . Dr Richard Fisher, director of NASA's Heliophysics division, told Mr Reneke the super storm would hit like "a bolt of lightning," causing catastrophic consequences for the world's health, emergency services and national security unless precautions are taken. US government officials earlier this year took part in a "tabletop exercise" in Boulder, Colorado, to map out what might happen if the Earth was hit with a storm as intense as the 1859 and 1921 storms. The 1859 storm was of a similar size to that predicted by NASA to hit within the next three yearsone of decreased activity, but more powerful eruptions. NASA said that a recent report by the National Academy of Sciences found that if a similar storm occurred today, it could cause "$1 to 2 trillion in damages to society's high-tech infrastructure and require four to 10 years for complete recovery." Staff at the Space Weather Prediction Center in Colorado, which hosted the exercise, said with our reliance on satellite technology, such an event could hit the Earth with the magnitude of a global hurricane or earthquake. The reason for the concern comes as the sun enters a phase known as Solar Cycle 24. Today we will read from the transcript of The Seventh Seal commencing at page 557:2 (241) with the objective of identifying Brother Branham's revelations and visions with the fulfillment of the prophecies of Scripture. Revelation 8:1, "When the Lamb had opened the Seventh Seal, there was silence in heaven the space of about half an hour"Brother Branham said there were "no angels singing, no praises, no altar service, no nothing." This took place at the end of the Laodicean Church Age when Christ's intercession as Mediator for the ignorance of PART Word was fulfilled. The sevenfold Spirit of God that anointed the angels to the Church Ages is the "Flame of Fire" that lit the Golden Menorah representing the Church. It has left Earth and returned to heaven as "seven lamps of Fire burning before the Throne [of God]" and the slain Lamb has left the sacrifice altar (Revelation 4:5). In the absence of blood, the Mercy Seat is now a Judgment Seat so that the prayers of those reliant upon the revelation of PART-Word for redemption cannot pass through to God because Christ's Mediation for ignorance is over so "heaven is silent. . . And lightnings and thunderings and voices issue from the Throne. And before the Throne is a glassy sea as transparent as crystal: and around the Throne on either side are four living creatures full of eyes in front and behind" (Revelation 4:5-6). Revelation 1:20, "The mystery of the seven stars which you saw in My right hand, and the Seven Golden Lampstands. The seven stars are the angels of the Seven Churches, [Paul, Irenaeus, Martin, Columba, Martin Luther, John Wesley, and William Branham]: and the Seven Lampstands which you saw are the Seven Churches". The crystal clarity of the "glassy sea" or brazen laver in which the sacrifice was washed before being presented confirms that Redemption is over. The antitype was the "living sacrifice" of the PART-Word saints who became written epistles of the Word for their day from Pentecost to the close of Laodicea. As members of Christ's end-time Bride we do not require mediation as we are foreknown as receiving the fullness of the Word and were thus fully redeemed in Jesus on Calvary. In the tribulation of Daniel's Seventieth Week "I saw the glassy sea mingled with Fire: and those who had been victorious over the [Judaeo-Roman] beast and its [once Protestant] image, and over its mark [Trinitarianism] and the number  of its name [Vicarivs Filii Dei], standing on the sea of glass with harps of God in their hands" (Revelation 15:2). These are the 144,000 elect Israelites who like us were redeemed in Christ on Calvary being predestinated to receive the fullness of the Word through the ministry of the two prophets of Zechariah 4, Matthew 24:31, and Revelation 11. Owing to the unanimous declaration by the nation, "Messiah's Blood be on us, and on our children" (Matthew 27:20-25), these must pass through the Fire of God's Judgments as martyrs for the faith of Jesus Messiah. After this victory "they sing the song of Moses the servant of God, and the song of the Lamb, saying, great and marvelous are Your works, Lord God Almighty; just and true are Your ways, You King of saints. Who shall not reverence You, O Lord, and glorify Your Name (Isaiah 45:23; Romans 14:11; Philippians 2:10)? For You only are holy: for all nations shall come and worship before You; for the righteousness of Your judgments are made manifest and acknowledged". Who is "the Lamb" these born-again Israelites are worshipping as "Lord God ALL-mighty," "King of saints," and "Lord, who ALONE is holy, and shall be worshipped by all nations," and what is His Name (Mark 8:38)? Revelation 4:6, "around the Throne on either side are four living creatures." This is further evidence that redemption is over since the four living creatures represent Christ's Bride of ALL Ages. Because of our revelation of "I Am [the] Alpha and Omega, the beginning and the ending, which is, and which was, and which is to come, the Almighty . . . Jesus Christ, the same yesterday, today, and forever" we are said to have "full of eyes in front and behind" (Revelation 1:8; Malachi 3:6; Hebrews 13:8). Brother Branham was asked in Questions on the Seals 23a and 24, "Who are these singing in Revelation 5:9 when the Lamb takes the Book, are these the raptured saints"? Quickly reading the Scripture, "And when He had taken the Book, the four living creatures and twenty-four elders fell down before the Lamb, each having harps, and golden vials full of odours, which are the prayers of saints. And they sung a new song, saying, You are worthy to take the Book, and to open the Seals thereof: for You were slain, and have redeemed us to God by Your blood out of every kindred, and tongue, and people, and nation." He replied, "That's the heavenly group, not yet the redeemed." Immediately the Holy Spirit brought correction. And He said, "That's them"!the raptured saints of Revelation 4:1, caught up in the Spirit [into heaven by the revelation of the Seven Seals] to see "things that must be after the Church Ages." The four living Creatures are the Bride of all Ages; redemption was over. In Revelation chapter six the four living creatures introduced the first Four Seals of redemption, but not the Fifth, Sixth and Seventh Seals because Christ's mediation was fulfilled and redemption was over. The Fifth Seal pertains to the non-elect Israelites martyred for the Law and the Prophets from Calvary to the opening of the Sixth Seal at the close of the Gentile dispensation; they will be judged and granted into eternal Life at the White Throne Judgment. Under the Sixth Seal the 144,000 elect Israelites will be purged and born-again, while non-elect groups will be purged in martyrdom and be judged at the Great White Throne. The Seventh Seal commenced at the end of redemption and the close of Laodicea and will continue manifesting unto the renewed heavens and Earth in the eighth day. Let us continue quoting from The Revelation of the Seven Seals p. 557:2 (241). Brother Branham said, "There was silence, hush, deadly silence in heaven for a half hour. All the host of heaven was silent for this half hour, when this Seventh Seal mystery in the Book of Redemption was broke open. Think of it; but it's broke. The Lamb breaks it. You know what? They were awed by it, I believe. They didn't know. There it was; they just stopped. Why? What is it? Now, none of us know; but I'm going to tell you my revelation of it. And now, I am not prone to be a fanatic. If I am, I'm ignorant of it. See? I am not given away to such as "leerious" or carry-ons and imaginary things. I've said some things, might have been kind of strange to some people, but when God comes around behind it and vindicates it and says it's the Truth, then that's God's Word. It may seem strange that way. See? And now, as certain as I stand in the platform tonight, I had the revelation that revealed. . . It's in a threefold manner. [As Paul explained in I Thessalonians 4:14-16]. That, I will speak to you by God's help of a fold of it. And then you. . . Let's go over there first. Here's the revelation to begin what. . . I want to tell you what it is. What happens is that those Seven Thunders that he heard thunder and was forbidden to write, that's what the mystery is laying behind those seven consecutive Thunders rolling out. Now, why? Let us prove it. Why? It is the secret that no one knows about. John was forbidding to write about it, even, even write a symbol about it. Why? This is why there was no activity in heaven; it might give away the secret. Do you see it now? If it's so great it must be included, because it's got to happen, but when the Seven Thunders . . .
Now, notice, when the seven angels come forth to sound their Trumpets, there was one Thunder." [Brother Branham is referring to Revelation 8:1-2 and Revelation 6:1, because the Seventh Seal is the revelation of the previous Six Seals]. When Israel was gathered there was a Trumpet. "When time shall be no more," the last Trumpet (Isaiah 27:13 Matthew 24:31; I Thessalonians 4:16; I Corinthians 15:52; Revelation 11:15), one thunder. But here [in Revelation 10:1-3 when Christ, the mighty Angel descended to Earth with the Book of Redemption open in His hand and placed Judgment on the Judaeo-Roman beast from the Sea and its (once) Protestant image, the beast from the Earth] is Seven straight Thunders right in a row: one, two, three, four, five, six, seven, straight, that perfect number. Seven Thunders in a row, uttered not . . . making justjust one, two, three, four, five, six, seven, straight. Then heavens couldn't write that. Heavens can't know about it, nothing else, because there's nothing [no written Word] to go on. It was a relaxing time. [The "relaxing time" is the holy convocation of this fiftieth day of the antitype of Israel's Pentecostal feast after all Seven Church Ages have ended but before the close of the Gentile dispensation (Leviticus 23:15-21)]. It was so great till, It was kept secret from the Angels [Matthew 24:36]. Now, why? If Satan should get ahold of it [as written Word in the Bible], he might do great damage. There's one thing he don't know. Now, he can interpret anything he wants to, and impersonate any kind of a gift (I hope you're learning), but he can't know this. It's not even written in the Word. It's a total secret. The Angels, everything shut up. If they made one move it might give something away, so they just shut up, quit harping; everything stopped. Seven, God's perfect number, Seven just right down the row. Seven thunders uttered straight together, like they were spelling out something. Notice, at that time, John started to write, and He said, "Don't write it" (Revelation 10:4). Jesus never spoke of it. John couldn't write it. Angels know nothing about it. What is it? It's the thing that Jesus said even the Angels of heaven didn't know nothing about it. See, see? He didn't know it Himself, said only God would know it [Matthew 24:36; Acts 1:7]. But He told us when "we begin seeing these signs coming up . . ." [Luke 21:28]. Now, you getting somewhere? All right. Notice, "we can see these signs coming up." See? If Satan could get a hold of it. . ."
Now we will bypass a few paragraphs and continue reading from the end of paragraph 4 (263) on page 559. "But you remember when He took me up there and said, "This is that third pull, and no one will know it." You remember that? Visions never fail. They're perfectly the truth. [Some time in the night of December 21, 1962 the Lord showed Brother Branham a dream in which he saw an enormous man who was supposed to be his father cruelly mistreating a woman who was supposed to be his mother by striking her to the ground with a three-cornered length of wood. When she stood up he would strike her down again. Although he was much smaller Brother Branham finally withstood the man and as he did he grew great big brawny faith muscles, took the man by the collar and said, "Don't strike her again! And if you do, you'll have to deal with me." The man became scared of him, and left her alone. The woman was the Church and the father was the denomination that rules over her. Whenever the Church rose up for a revelation, the denomination would strike her down with the three-cornered stick of its trinity doctrine. On the morning of December 22, the Lord spoke to him in a vision, "Go out to Tucson. Be north of Tucson, a great blast," [Revelation 4:1] what would take place; "the Seals would be opened," the Seal that revealed these things" (The Unveiling of God, p. 50:336b)]. You remember that? Notice, there was only one great burst of thunder, and seven Angels appeared. Is that right? One burst of thunder, seven Angels appeared. Now, notice, remember the vision of the constellation? Charlie, I. . . Here you are. Something going on, I told you, this week that you. . . It's been all around you, but I wonder if you noticed it. Remember the constellation of the vision of the Angels when I left here to go to Arizona? You remember [my Message delivered on December 30, 1962], "Is This the Sign of the End, Sir?" You remember that? Notice, there was only one great burst of thunder, and seven Angels appeared. Is that right? One burst of thunder, seven Angels appeared. [Revelation 10:1-7]. "And I saw the Lamb when He had opened the First Seal, and I heard as it was a voice of a thunder, and one of the four beasts said, Come and see". Notice, one thunder, seven Messages that's been sealed up and cannot be revealed until the last day, at this age. See what I mean? [Brother Branham recounted these experiences to his Church on December 23 in the Message "Reproach for the Word" (p. 3:2  p. 8) and promised that the following Sunday he would explain and tie these things to visions seen years before in which the Lord had said that when these things came to pass he must go west to meet the second or 'parousia' Coming of the Lord under a constellation of stars as the wise men from the east traveled west to meet Christ under a heavenly constellation at His first Coming (Genesis 49:10-11; Numbers 24:17; Matthew 2:1-11; Micah 5:2). Here is what he said in his Message Is This the Sign of the End, Sir? (p. 25:3  27:6): "Now, it seemed like that my little son Joseph was by my side. I was talking to him. Now, if you'll watch the vision real close, you'll see why Joseph was standing there. And I looked, and there was a big bush. And on this bush was a constellation of birds, little bitty birds, about a half inch long and a half inch high, they were little veterans. Their little feathers was beat down. And there was about two or three on the top limb, six or eight on the next limb, and fifteen or twenty on the next limb, coming down in the shape of the pyramid. . . And they were pretty well worn out. And they were watching eastward, and I was at Tucson, Arizona, in the vision. For it made it so purpose that He didn't want me to fail to see where it was at, I was picking a sand burr off of me from the desert. And I said, "Now, I know this is a vision, and I know that I'm at Tucson. And I know that them little birds there represent something." And they were watching eastward. And all of sudden they taken a notion to fly, and away they went eastward. And as soon as they left, a constellation of larger birds came. They looked like doves, sharp pointed wings, kind of a gray color, a little lighter color than what these first little messengers was. And they were coming eastward swiftly. And no sooner than they got out of my sight, I turned again to look westward, and there it happened. There was a blast that actually shook the whole earth. Now, don't miss this. And you on tape, be sure you get this right. First a blast [Revelation 4:1]. And I thought it sounded like a sound barrier, or ever-what you call it when planes cross the sound and the sound comes back to the earth: just shook like roared, everything. Then it could've been a great clap of thunder and lightning like. I didn't see the lightning. I just heard that great blast that went forth that sounded like it was south from me, towards Mexico. But it shook the earth, and when it did, I was still looking westward. And way off into eternity I saw a constellation of something coming. It looked like that it might've been little dots. There could've been no less than five, and not more than seven. But they were in the shape of a pyramid, like these messengers coming. And when it did, the power of Almighty God lifted me up to meet them [Revelation 4:1]. And I can see it. It's never left me. Eight days is gone, and I can't forget it yet. I never had anything to bother me like that has. My family will tell you. I could see those Angels, those shaped-back wings traveling faster than sound could travel. They come from eternity in a split like a twinkling of an eye, not enough to bat your eye, just a twinkle. They were there. I didn't have time to count. I didn't have time, no more than just look. Mighty ones, great powerful Angels, snow white, wings set in head, and they were "whew wheeew," and when it did, I was caught up into this pyramid of constellation. And I thought, "Now, this is it." I was numbed all over, and I said, "Oh, my. This means that there will be a blast that will kill me. I'm at the end of my road now. I mustn't tell my people when this vision leaves. I don't want them to know about it, but the heavenly Father has let me know now that my time is finished. I won't tell my family so they'll worry about me, because He's fixing to go and these Angels has come for me, and I'll be killed pretty soon now in some kind of an explosion." Then it came to me, while I was in this constellation, "No, that isn't it. If it would've killed you it would've killed Joseph, and I could hear Joseph calling me." Well, then I turned again, and I thought, "Lord God, what does this vision mean?" And I wondered, and then it come to me, not a voice, just come to me. Oh, that is the Angels of the Lord coming to give me my new commission. And when I thought that, I raised up my hands, and I said, "O Lord Jesus, what will You have me do?" And the vision left me. For almost an hour I couldn't feel. Now, you people know what the blessings of the Lord is. But the power of the Lord is altogether different. The power of the Lord in them kind of a places, I felt it many, many times before in vision, but never like that. It feels like a reverent fear. I was so scared till I was paralyzed in the presence of these Beings. I tell the truth. As Paul said, "I lie not." You never caught me saying anything wrong about something like that? Something's fixing to happen. Then after while I said, "Lord Jesus, if I'm going to be killed, let me know so I won't tell my people about this; but if it's something else, let me know." Nothing answered. After the Spirit left me for about a half hour I guess or more I said, "Lord, if it is then that I am going to be killed, and You're finished with me on earth, and I'm going to be taken home now, which if that's it, that's fine. That's all right." So I said, "If it is, let me know. Send Your power back on me again. Then I'll know not to tell my people or anybody about it, because You're fixing to come catch me away." And nothing happened. And I waited awhile. Then I said, "Lord Jesus, if it did not mean that, and it means that You've got something for me to do and it'll be revealed to me later, then send Your power." And it almost took me from the room. I found myself somewhere over in a corner. I could hear my wife somewhere trying to shake a door. The door in the bedroom was locked. And I had a Bible open, and it was reading. . . I don't know, but it was in, I believe, Romans the ninth chapter, the last verse: "Behold I lay in Sion a cornerstone, a stumbling stone, a precious cornerstone, [a capstone], and whosoever believeth on Him shall not be ashamed." And I thought, "It's strange I'd be reading that." (Spirit still packing me in the room). And I closed up the Bible and stood there. I went over to the window. (It was about ten o'clock in the day or better), and I raised up my hands, and I said, "Lord God, I don't understand. This is a strange day to me. And I'm beside myself almost." And I said, "Lord, what does that mean? Let me read again, if it be You." Now, this sounds juvenile. And I took up the Bible, opened it up. There it was again at the same place: Paul telling the Romans that the Jews tried to accept it by works, but it's by faith that we believe it"]. We will continue reading The Revelation of the Seven Seals from page 560:1 (268) where Brother Branham describes the fulfillment of this vision. "Now, have you noticed the mysterious parts of this week? That's what it is. That's what it's been. It's been, not a human being, a man; it has been the Angels of the Lord. Notice, there's witnesses of three setting in here, that a week ago (a little over a week ago) I was up way back into the mountains, nearly to Mexico, with two brethren that's setting here, picking cocklebur, or sand burrs off of my trouser leg, and a blast went off that almost, looked like, shook the mountains down. Now, that's right. I never told my brethren, but they noticed a difference. And He said to me, "Now, be ready. Go east." [Back to his Church to preach the revelation of the Seven Seals]. And Brother Fred in here tonight is a witness, and Brother Norman. As we went down, I almost persuaded that man to stay and get his game. Is that right, Brother Sothmann? Yeah, there he stands right there. I persuaded . . . but yet, He said, "He won't do it." I never said nothing, went on. Something setting by the side of the tent the day that. . . You remember, Brother Sothmann, that I, as soon as some things was being told that I put you and Brother Norman. . . Where's Brother Norman? Back there. Put them under oath that they wouldn't mention what was taking place. Is that right? Did I turn around and walk away from that tent, like that? Is that right? Because this is what it was, exactly what it was, and knowing that I couldn't say it till it happened to see if the people would understand it. And did you notice that one Angel, I said in there, was a strange Angel? He looked more to me than any of the rest of them. [It was his own theophany]. You remember that? They were in a constellation; three on a side and one on top. And the one right next to me here, counting from the left to the right, would've been the seventh Angel. He was brighter, meant more to me than the rest of them. You remember, I said he had his chest out like that, and was flying eastward. You remember like that? And I said, "It picked me up, lifted me up." Do you remember that? Here it is. The one with the Seventh Seal, the thing that I've wondered all my life. Amen. Them other Seals meant a lot to me, of course, but, oh, you don't know what this has meant. For one time in life. . . I prayed; I cried out to God. IIIafter that Phoenix meeting, any of the people there with me know; I laid in the mountains. One morning I got up and went up in Sabino Canyon; it's a great rugged high mountains. And I'd went up in there, and there was a little foot trail after you lead off, go on up into Lemmon Mountain which is a thirty mile walk, and there about thirty foot of snow up there. So, up in the mountain real early before day, going up through this little foot trail, rolling rocks along, I felt led to turn this a-way. And I turned and went up into some great jagged rocks, oh, my, hundreds of feet high. And I knelt down between those rocks. I laid down this Bible and laid down this book, this little tablet. I said, "Lord God, what does this vision mean?" I'mI'mI'm. . . I said, "Lord, does it mean my dying?" You remember I told you I thought it might mean my death, 'cause something exploded till it just shook me to pieces. You remember. How many knows it, have heard it was? Why, sure, all of you. And I thought it could mean my death. And then in the room, I said, "Was . . . whatwhatwhat was it, Lord. Whatwhat does it mean? Does it mean I'm going to die? If it is, all right; I won't tell my family. Just let me go on (See? ), if my work's finished." And I said. . . Now, what was it? But He sent a witness back (You remember me telling you?) that it wasn't that, it was a furtherment of my work. Oh, you get it. See? And setting up in Sabino Canyon [in January, 1963] . . . The heavenly Father knows this, just as true as you see that come to pass, those Angels come right down and a-vindicated every Message to be the same [i.e. correct or THUS SAITH THE LORD]. Then you know whether it comes from God or not. It was foretold you by a vision. I couldn't tell you until the service was over, 'cause I was forbidden to. In Sabino Canyon, sitting up there that morning, I had my hands up, and my . . . the wind had blowed my old black hat down. When I was standing there with my hands up, praying. I said, "Lord God, what does this mean? I can't understand it, Lord. What am I to do? If it's my going home time, let me go up here where they'll never find me. I don't want nobody to be mourning around if I'm going. II want just the family to think that I just took a walk, and they won't find me. Hide me away somewhere. If I'm going to go away, why, just let me go. Maybe Joseph will find my Bible laying here someday, and let him use It. See? If I'm going away, let me go, Lord." And I had my hands out, and all at once something hit my hand. I don't know. I can't say. Did I go to sleep? I don't know. Did I go into a trance? I don't know. Was it a vision? I can't tell you. Only thing I can say is when I. . . Just the same thing like them Angels was. And it struck my hand, and I looked, and it was a sword, and it had pearl handles, real pretty; and had a guard over it with gold, and the blade looked like, something like a chrome, like silver, only it was real shiny. And it was so feather-edge sharp, Oh, my. And I thought, "Isn't that the prettiest thing?" just fit my hand. I thought, "That's awful pretty." But I said, "Hey, I'm always 'fraid of them things, a sword." And I thought, "What will I do with that?" And just then a voice shook down through there that rocked the rocks, said, "It's the Sword of the King." And then I come out of it. "The Sword of the King. . ." Now, if it said, "a Sword of a King. . ." but it said, "The Sword of the King," and there's only one "the King," and that's God. and He has one Sword; that's His Word, what I live by. And so help me, God, standing over His holy desk here with this holy Word laying here, it's the Word. Amen. Oh, what a day we're living in, what a great thing. See the mystery and secret? The third. . . Standing there, when this left me, something just come to me and said, "Don't fear." Now, I didn't hear no voice, like on the inside of me spoke. I just tell you the truth, just exactly what happened. Something hit and said, "Don't fear. This is that third pull. . ." . . . and at the end of the seventh angel's Message, ALL the mysteries of God would be known . . . The Lord said "Don't try to explain that." Said, "This is the third pull, but I'll meet you in there" (ibid p. 560:1  562:5; 268-289). The Third Pull is the opening of the Word which takes us into the Tent vision. In a previous vision the Lord chided the Prophet for trying to explain the first two 'pulls' to ministers, causing carnal impersonations, telling His Prophet, "You can't teach Pentecostal babies Supernatural things. Now, let them alone".